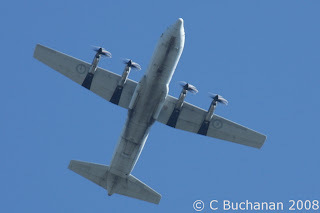 The Royal New Zealand Air Force was busy this morning with at least 5 Airtrainers and 1 Hercules noted flying into base Woodbourne. Noted arriving in a short period this morning was a flurry of 4 Eagle Air 1900D's, the noteable movement was NZ2921 arriving from Eagle's home base of Hamilton, the other aircraft were on scheduled services. Also noted flying in and out during the day was Sounds Air Cessna Caravan ZK-TZR still sporting its blue colour scheme. This was reportedly supposed to have been repainted into the standard Sounds Air orange scheme during the preceeding two weeks. Well I'm back from my trip to Brisbane. Unfortunately time wasn't on my side so I only got to Longreach and didn't get to see any of the other museums I had planned to visit. I had 8 flights on this trip routing BHE-AKL-BNE-BKQ-LRE-TSV-BNE-AKL-WLG-BHE. 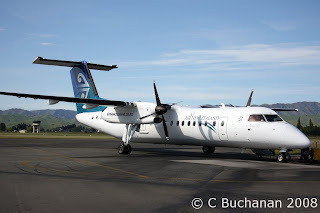 The first flight was NZ8210 BHE-AKL (Blenheim-Auckland) on Air New Zealand Link (Air Nelson) Bombardier Q300 ZK-NEQ. The second flight was NZ135 AKL-BNE (Auckland Brisbane) on Air New Zealand Boeing 747-4F6 ZK-SUJ - Auckland. My 3rd flight of the trip was QF2530 BNE-BKQ-LRE (Brisbane-Longreach via Blackall) on Qantas Link (Sunstate Airlines) Bombardier Q300 VH-SBJ. 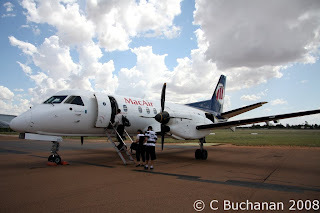 After my time in Longreach I caught CC143 LRE-TSV (Longreach-Townsville) on MacAir Saab VH-UYF. This was an interesting flight as it was originally scheduled as a Saab LRE-WIN-TSV (Longreach-Townsville via Winton) it was then downgraded to a Metroliner before being reinstated to a Saab with the departure time moved forwards by 40mins and the Winton stopover cancelled! After an extended stopover in Townsville I caught QF977 TSV-BNE (Townsville-Brisbane) on Qantas Airways Boeing 737-338 VH-VZC - Innisfail. 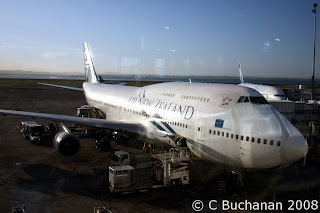 My journey home began with NZ136 BNE-AKL (Brisbane-Auckland) on Air New Zealand Boeing 747-419 ZK-NBS - Bay of Islands. The second leg was NZ467 AKL-WLG (Auckland-Wellington), on board Air New Zealand Boeing 737-319 ZK-NGG. This flight being delayed 20mins due to the flow on effect of the fire in Wellington Terminal earlier in the afternoon. The final leg of the trip was NZ2459 WLG-BHE (Wellington-Blenheim) on Air New Zealand Link (Eagle Air) Raytheon Beech 1900D ZK-EAJ. This flight was over half an hour late also due to the flow on effects from the fire. Frost was forcast for the next morning so during the evening the air was alive with the sound of the frost fighting helicopters arriving from all over the country. Pics of some of these can be found on Gavin's Blog or here. Arriving into Woodbourne at 0900 was Brenzil Falcon 2000EX VH-CRW. It arrived from Napier and continued on later in the day to Queenstown. VH-CRW is a regular visitor to Blenheim with the owners having vineyard interests here. Weather woes again today across the country. Fligths into and out of Wellington were cancelled all morning due to gale force North Westerly winds. And fligths into and out of Queenstown were cancelled due to low cloud, rain and snow. Aircraft that did depart bound for Wellington this morning were forced to divert. Jet flights were noted diverting to Palmerston North and Christchuch or returning to either Christchurch or Auckland. Prop flights were noted diverting to Palmerston North, Christchurch, Nelson and Woodbourne. Also scheduled was NZ2307 WLG-BHE-TIU this was continually pushed back until the BHE-TIU leg was cancelled. It finally departed WLG for BHE around 1340 as Eagle907. Departing early after their overnight at Woodbourne, were the two RAAF C130Js A97-450 & A97-467. A97-467 then returned during the evening. Air New Zealand Link flight NZ8019 AKL-BHE was cancelled this morning. Instead a Q300 arrived from Wellington at 1010 as NZ8941 before flying the NZ8018 BHE-AKL service delayed by almost an hour. A97-467 departed Woodbourne at 1030. The RNZAF training fleet in and around Woodbourne grew today with up to 7 airtrainers operating in the region. the following were noted at Woodbourne through out the day. NZ1987, NZ1990, NZ1993, NZ1994 & NZ1997. Iroquoi NZ3814 was once again noted operating above Woodbourne. Other movements in the area were former ZK-KLC now ZK-TZT and ZK-TZR. Sounds Air GA8 Airvan KLC had been for sale for some time and on 23-Sept it was registered as TZT. it departed Koromiko today for Taupo believed to be on delivery to Iszard Pacific Aviation. 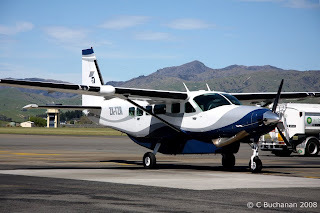 Sounds Air are to replace the Airvan with another Cessna Caravan. Iszard Pacific Aviation Caravan ZK-TZR arrived into and departed from Omaka to/from Taupo during the afternoon. Iroquoi NZ3814 once again was operating overhead Woodbourne. Two airtrainers were noted still on the ground at Woodbourne early afternoon. Arriving from and departing to CHC early afternoon was Garden City Helicopters / New Zealand Flying Doctors C421B ZK-KFB on a medical transfer. Also noted arriving early afternoon was Pionair Convair 340 VH-PDX making landfall in the country after a direct flight from Sydney to Palmerston North. Arriving into Woodbourne at 1300 was Iszard Pacific C208 Caravan ZK-TZR. It had arrived with two ferry pilots on board, before departing to Wellington at 1330. It is believed that this is bound for Sounds Air.